STORMBORN clothes ready for sale! 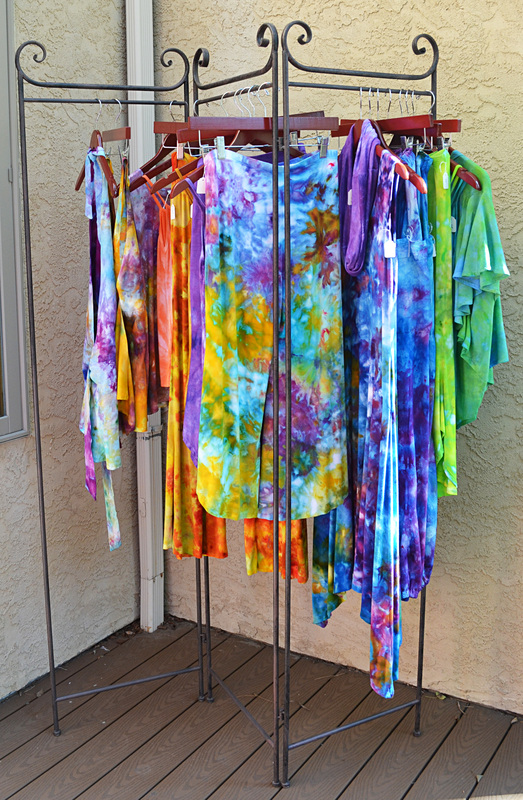 Ice-dyes are like tie-dye on steroids, and much less predictable! 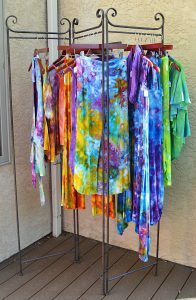 After dyeing some quilting fabric, I couldn’t resist making garment-dyed dresses, camisoles, harem pants, lotus capri’s, and a few jackets and vests in the Game of Thrones colors of ice and fire. The clothes are rayon jersey or woven rayon, sewn for Dharma Trading in Indonesia. The dyes are Procion fixed with soda ash. All of the garments have been washed three times in the dying process, so they won’t shrink. A curious thing about rayon is that the fibers are weak when wet, so no wringing or line-drying! It really loves a medium hot dryer setting. The woven garments benefit from a touch-up to hems and bindings with a cool iron (wool setting). Posted in Color, Fiber | Comments Off on STORMBORN clothes ready for sale! 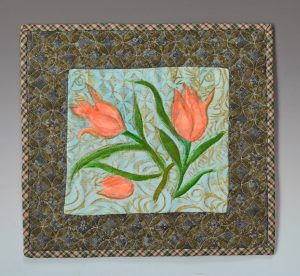 I use these small quilts as a kind of sketching, before I consider using a technique or pattern on a bigger piece. 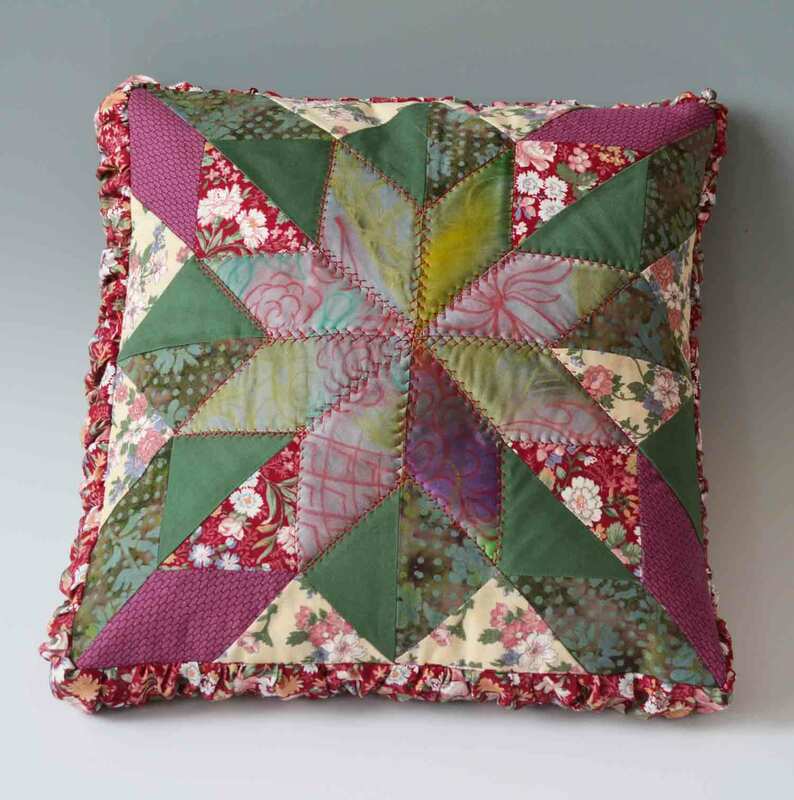 Sometimes these little quilts are perfect for customers who have small spaces, or no experience of quilts as art. 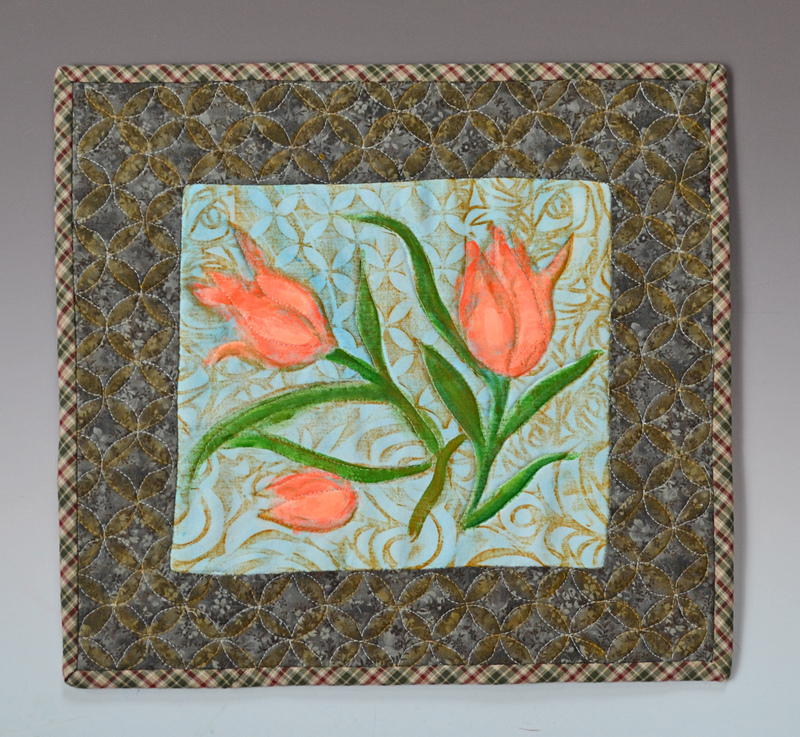 This one is a texture study using a fabric-printing block for the tulips, stencils with a gold dye crayon, the ‘7 beauties’ quilt pattern of interlocking circles (for the frame), and a plaid binding. Quite a lot, really, for a 13″ square. I also fit the small quilts with corners on the back to hold a piece of illustration board for hanging. They require just one picture hook, screw, or nail, so there is no wrassling with a gallery-type sleeve, monofilament, or special hanging rod. …a new commercial stencil (lower left) used on silk with Montana spray paint, Chroma-craft brushed on a blue background, and pentel dye sticks over a rosy dyed silk charmeuse. 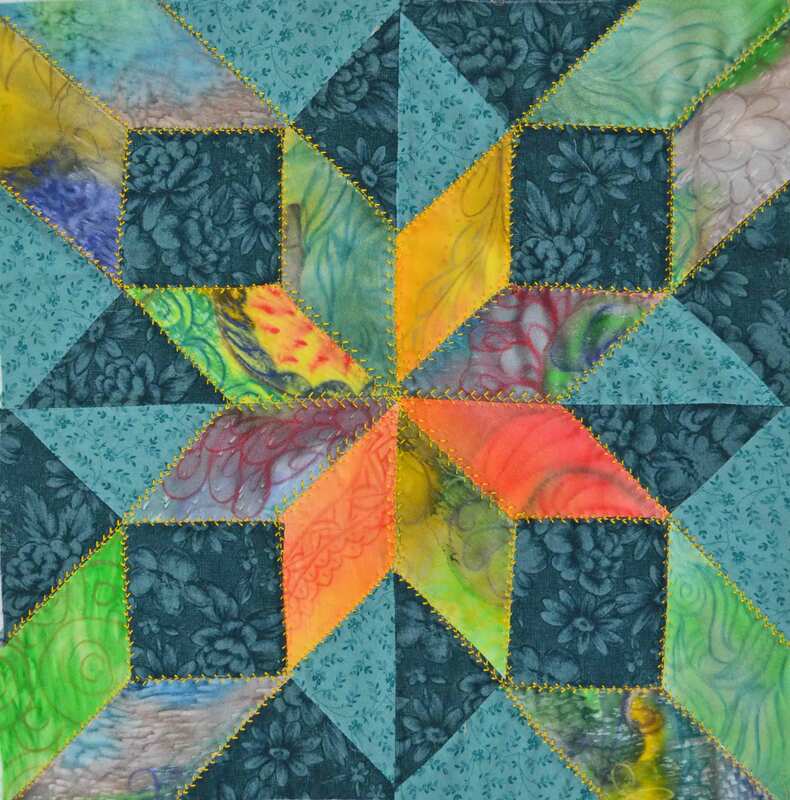 I’m looking for overall patterns to use with more quilts in the Interstellar series. 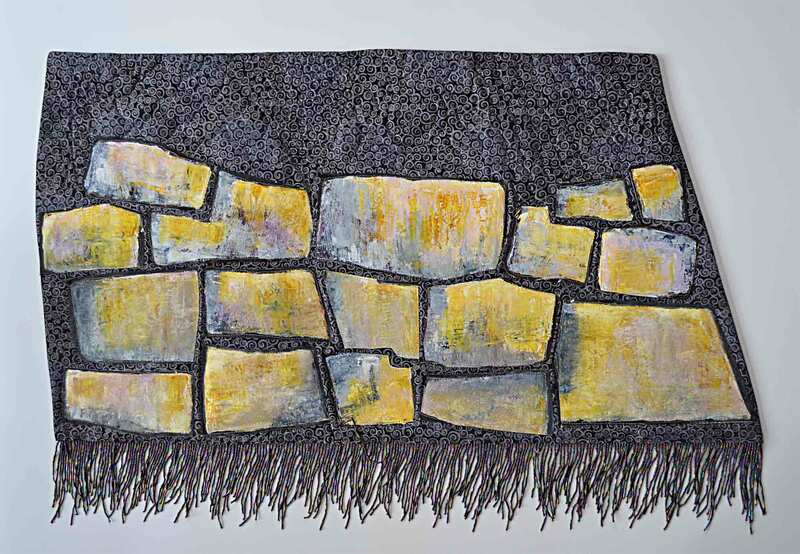 I just read Inca Garcilaso de la Vega’s history of the Inca, as well as some material on Inca textiles. This civilization is perhaps the most alien of any ruling class in human history. They were so weird that I also wrote a story about their quipu (knotted strings) as a binary version of an alphabet. 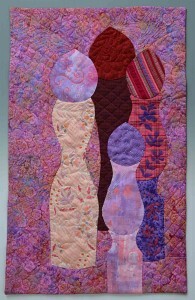 This series of 3 quilts started with a drawing of four peppermills on the table. The shapes were similar, but varied in proportions, and I liked the way that the overlapping shapes created perspective without the pesky business of making a realistic 3D rendering. I chose a color scheme that I rarely use, leaning toward adjacent colors (red and violet) with limited value range. 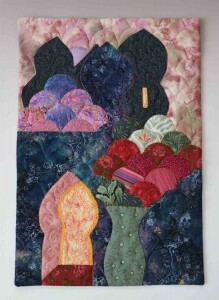 The background is heavily quilted because there is a lot of it, and the handpainted fabric is quilted with only a few hand embroidery stitches. 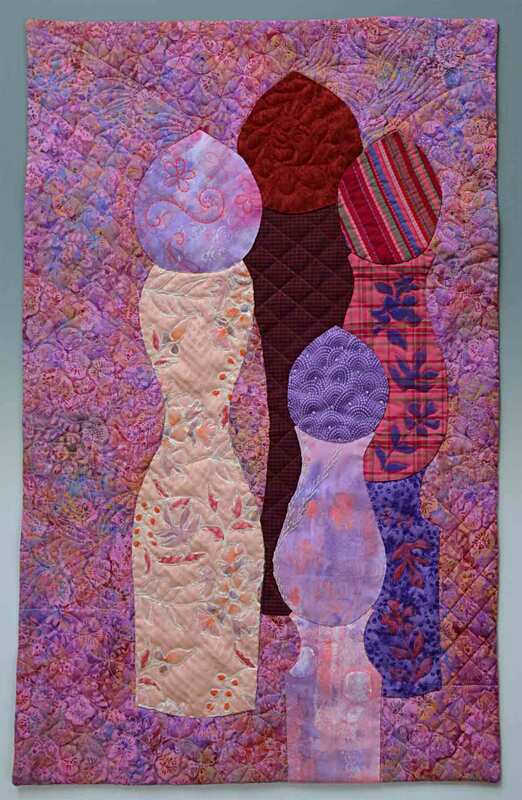 This lavender/red fabric was made in a ‘scroll’ that I learned from Linda Colsh in 2015. 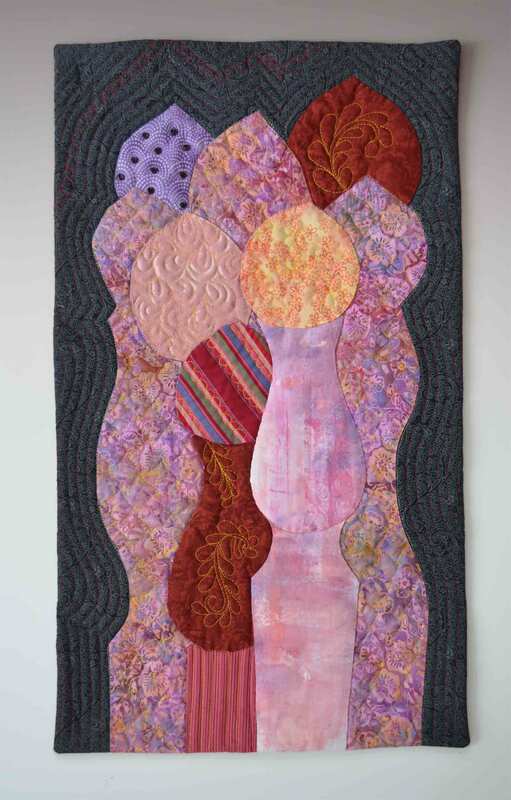 When I had arranged all of the shapes, I cut away the background fabric in as big a piece as I could manage. 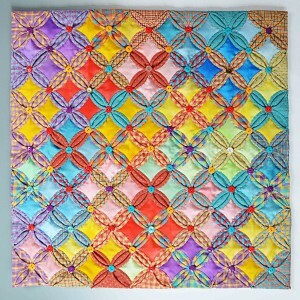 This scrap became a ‘gift’ for the composition of the next quilt. 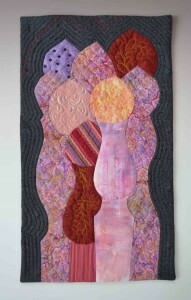 I was careful to save lots of scraps with this project in order to incorporate them into the next quilt. It felt like a very traditional way of working, to value all the leftovers. The challenging part was to find a way to also value the shapes of the scraps. After piecing together the 4 Classic Shapes quilt, I had two large scraps cut from the background–the flowery shapes on the right and the left, as well as some left-over handpainted pink/purple fabric. The scraps were long, but thinner than the original quilt, so this design is taller and skinnier, almost like minarets on the horizon. The hand-painted fabric is in the foreground, with no quilting. It is quite a bit stiffer than the other fabrics, and the patterns are very subtle, so quilting would obscure the complexity of the fabric. 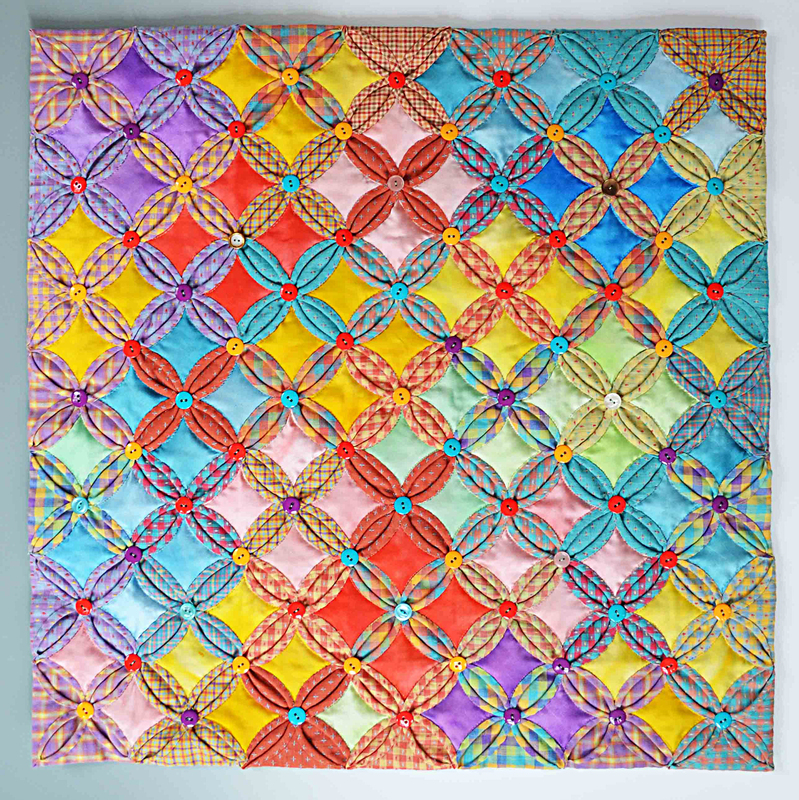 The brighter fabric is a new addition, which follows on to the next quilt as a kind of gift of its own. Another quilter at the Alegre Retreat (’04 or ’05) told me about the way that scraps could be used as Gifts to built a series of quilts. I believe that she was in a class with Michael James. Casbah Dream is a tribute to the drawings and paintings that Matisse did of Moroccan subjects. The Gifts that generated this quilt are the two black domes (cut from the background of Minarets) , and the many small scraps for the clamshell parts. I added green and some blue to this color scheme. The Casbah gate in Tangier has been drawn and painted by many artists. The clamshells have a nice evocative shape that could be architectural, or possibly even botanical. Many of my silk quilts started with a drawing in a resist, so that the shapes within the painting could be flooded with silk paints. This winter, I was looking for a more abstract way to paint silks. 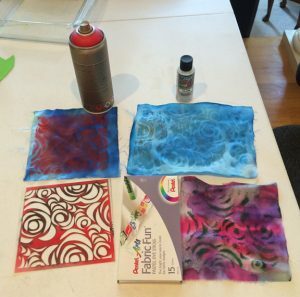 The Gelli plate and some water-soluble crayons provided a faster way to generate colorful silks with the potential for Zentangle® designs and other patterns. 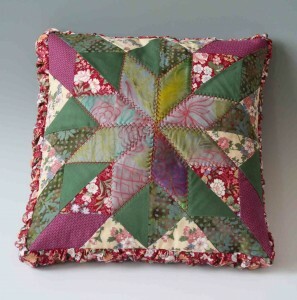 Once the fabrics were ‘built,’ I cut them up to make a very traditional quilt block. I seem to like the contrast between the busy hand-painted or marbled fabrics and more typical quilting cotton prints.